The 10 saltiest foods total 44% of all the sodium eaten daily, and are the prime targets for cutting back, a Centers for Disease Control and Prevention report stated. Data from 7,227 participants were analyzed from the 2007-2008 What We Eat in America, part of the National Health and Nutrition Examination Survey. An initial 24-hour dietary recall was administered by a Mobile Examination Center, and the second recall was administered about a week later by phone. Results appeared online at the Morbidity and Mortality Weekly Report. Guidelines recommend less than 2,300 mg of salt per day for most people and 1,500 mg for children ages 9 and older. 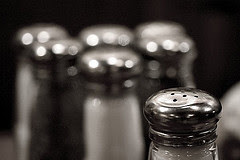 But the mean daily sodium consumption in the survey was 3,266 mg in prepared foods, not counting salt added when eating. --snacks such as chips and pretzels (3.1%). During at least one of the two 24-hour dietary recall days; 80% of people reported eating bread and rolls, 56% ate cheese, 51% ate snacks, and 48% ate poultry. For most of these categories, more than 70% of the sodium consumed came from foods bought at a store. For pizza and poultry, respectively, 51% and 27% of sodium came from fast food restaurants. The report recommends that local and federal governments encourage reductions of salt in foods, and that clinicians continue to press the issue with patients. A 25% cut in sodium in the top 10 foods could result in an 11% reduction (approximately 360 mg) in the daily mean sodium consumed. It's been projected that reducing mean salt consumption by 400 mg a day could avert up to 28,000 deaths from any cause and save $7 billion in health care costs annually.